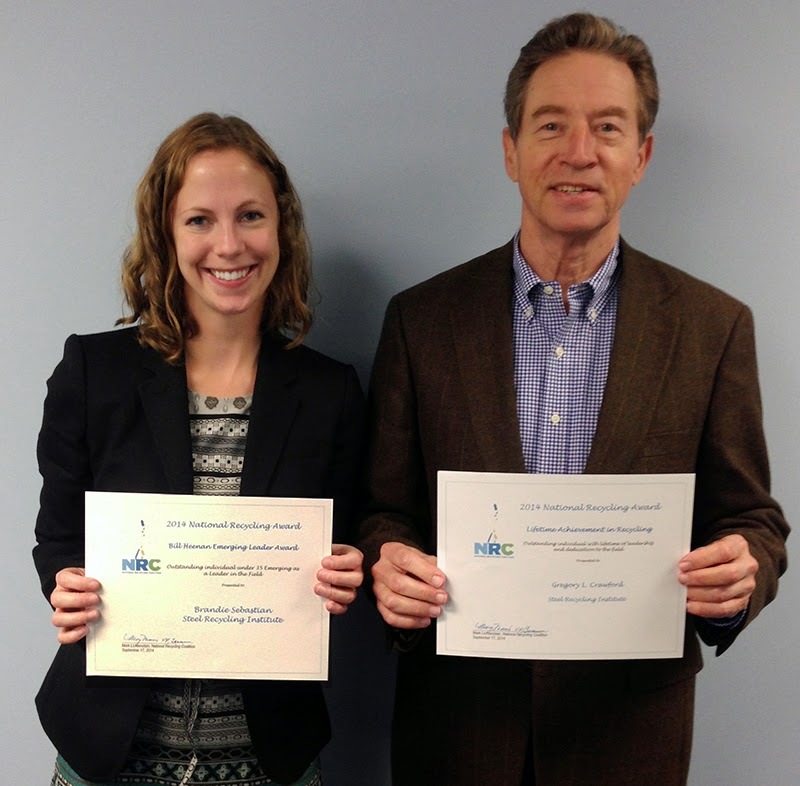 PITTSBURGH, Pa (September 23, 2014) – The Steel Recycling Institute (SRI) received recognition from the National Recycling Coalition (NRC) as seven industry leaders were given National Awards at a special luncheon during the Resource Recycling Conference this past week in New Orleans by Resource Recycling Magazine. Brandie Sebastian (Manager, Life Cycle Assessment) was awarded the Bill Heenan Emerging Leader Award, given to an outstanding individual under 35 recognized as a leader in their field. Gregory L. Crawford (Executive Director) received the highest honor, a Lifetime Achievement in Recycling award, recognizing him as an outstanding individual with a lifetime of leadership and dedication to the field. Brandie joined the SRI in 2013, serving as the North American steel industry’s technical expert on life cycle assessment (LCA), modeling and practices. In this capacity, she investigates and promotes the life cycle advantages of steel vs. competing materials. In less than a year, Brandie has worked on the development and provision of life cycle inventory (LCI) datasets for North American steel products, integrated new North American LCI data into key databases, and engaged with international and domestic standardization and regulatory organizations. She is a certified LCA practitioner through the American Center for Life Cycle Assessment and is a member of the U.S. Technical Advisory Group on the international standards for LCA (ISO TAG 207). Prior to joining SRI, Brandie spent over six years in environmental and sustainability consulting as a project engineer and manager. Brandie’s role and participation in North American LCA for steel is key to credibly advancing steel as the environmental material of choice in the automotive, construction, and containers market sectors. Greg Crawford has spent his much of career working to maximize the recycling of post-consumer materials. He spent seven years with Reynolds Aluminum managing over 125 employees at five shredder plants and buy back network locations. Beginning in 1989, Greg became the Technical Director and later Vice President of Operations for the Steel Can Recycling Institute (renamed as The Steel Recycling Institute in 1993). His plan for the steel can recycling infrastructure resulted in the recycling rate of steel cans to grow from 15% (1989) to its current recycling rate of 71% (2012). From day one, he stated that all empty steel cans; food, beverage, aerosol and paint cans should be included in every community’s recycling program. With his assistance and guidance, the seven regional recycling managers completed 18 months of “infrastructure development” which involved meeting with municipal, county, and state recycling official, haulers, MRF operators, and scrap dealers, as well as each of the steel mills and iron foundries across the country to discuss the homogenous chemistry of “today’s” steel can and get them to aggressively purchase and melt steel can scrap. Greg worked with various government agencies and the Institute of Scrap Recycling Industries to fully recognize increase the recycling of automobiles, appliances, and structural steel. Since becoming the Executive Director in 2010, Greg has guided the SRI’s efforts to collect and disseminate Life Cycle Inventory data for various steel products. In addition to serving on scores of recycling and construction related committees, Greg served the recycling industry as the Chair of the National Recycling Coalition and Chair of the Buy Recycled Business Alliance. He currently serves on the Keep America Beautiful board. He also served as Executive Director of the Cool Metal Roofing Coalition. Greg is retiring in January 2015. When a product reaches the end of its useful life, it is discarded. 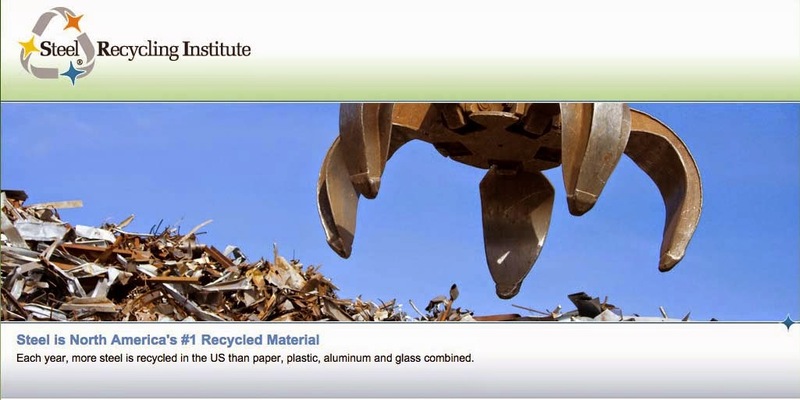 For materials that have recycling value, such as an empty steel can or appliance, they are responsibly given new life through a recycling service such as curbside pickup or a drop-off location. But, what happens when a large Navy or commercial vessel is no longer in ‘ship shape?’ Much like other recyclable steel products, ships are steel-intensive sources of valuable, recyclable materials. Ship dismantling is a planned process of systematically breaking down ships that have reached the end of their useful life to reclaim their recyclable materials—especially steel. The dismantling of ships can range from small, private ships to 15,000 ton U.S. Navy vessels. And, over 90 percent of the materials in these large vessels can be recycled or reused. In fact, last year, 15-20 million tons of steel was recovered worldwide from ship dismantling. But, despite the planned nature of the recycling process and the environmental and worker protections that are in place, the industry still faces a challenge of public misconceptions about the environmental effects and potential dangers of the dismantling/recycling process. While a lot of these concerns originate more from international procedures, domestic practices still face negative stereotypes with the general public because of some of those international procedures and the history of the industry. However, according to Curt Michanczyk, Director of the Office of Ship Disposal Programs for the Maritime Administration, the domestic ship recycling process once known as ‘ship scrapping’ is now a planned dismantling/recycling process that maximizes the collection of recyclables while protecting the environment and the safety and health of the workers involved. Michanczyk feels people who are not closely associated with the industry may think ships are still abandoned irresponsibly, but that too is a misconception. The process that the Maritime Administration uses now includes an extensive qualification process for industrial facilities to be approved for Government ship dismantling contracts. Since only approved facilities can compete for contracts, the administration can track and have active oversight to ensure the responsible dismantling of these vessels. After a company is approved for a contract, they transport the ship to their facility. Due to the size of many vessels, this work is often done outside in the elements which also contributes to industry misconceptions. Due to this high visibility of the process, local municipalities may express concerns despite the industrial jobs that the facility can offer struggling areas. After the vessel is brought into the facility, the next step is identifying and characterizing the hazardous materials. Older ships contain asbestos, lead paint, fuels or other materials that may threaten the environment and endanger workers and those materials must be located, sampled, sent to labs, and then verified for special handling and disposal. Areas that contain these materials are cordoned off to allow access to only trained personnel that can properly prepare the space and certify it is cleaned. Once areas are declared acceptable, recycling of useful items can begin. A lot of equipment is able to be reused. Valves can be reconditioned. Motors can be resold. It is very cost effective. Once these smaller items are removed, the deconstruction of the vessel can begin. Generally starting from the top down, these ships that can range from 300-700 feet long can take months, or even up to a year, to carefully take apart and conserve the quality of any materials for reuse and recycling. On average over the past 10 years, the Maritime Administration has issued 18 contracts a year for dismantling decommissioned vessels from the U.S. Navy, Coast Guard and other federal agencies. Over 200 ships have been disposed of since 2001. And for the next month and a half, over 73 proposals came in from students across 37 different schools and multiple countries. All of them describing unique, creative and innovative ways to turn this historically significant steel scrap into something remarkable. 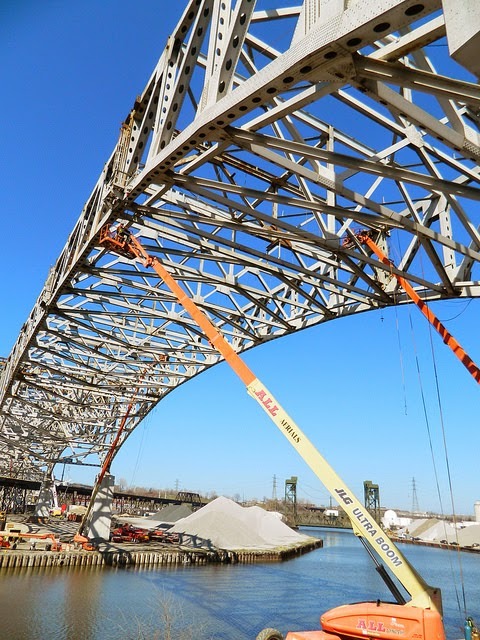 In all, the house will be utilizing approximately 792 tons of steel salvaged from the Bay Bridge project. Making a structure this size, without utilizing salvaged steel would require the mining of more than 1590 tons of iron ore, limestone and coal. It's the equivalent steel that would be used to build a fleet of nearly 1600 cars. But, rather, it will take a historic part of the Bay Area and convert it to a structure that will become historic in its own right. 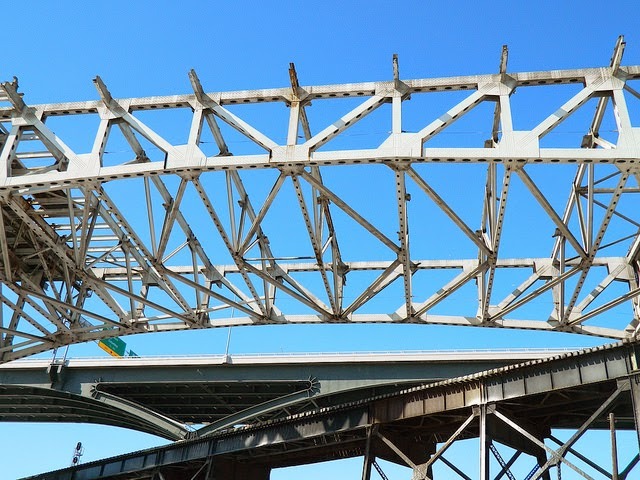 The Bay Bridge House is a project that David and his wife began in the summer of 2012 when they were startled to learn that a significant portion of the historical Bay Bridge, connecting Oakland and San Francisco, steel scrap was not being conserved. The project’s intentions were to do something more creative with some of the scrap, using a few small sections to create a modern self-sustaining house and eco multi-use space for the world. 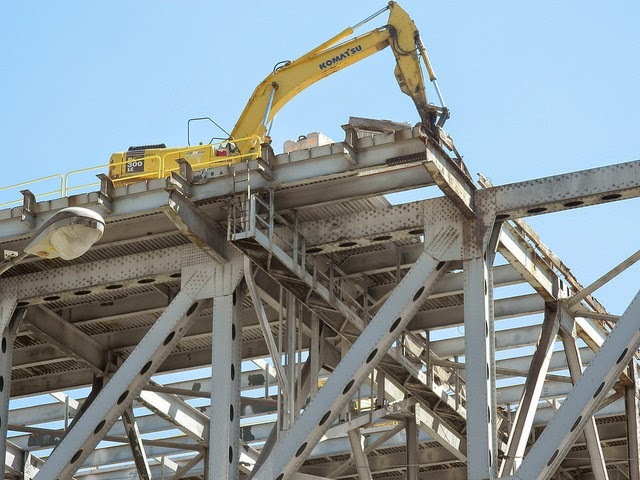 By utilizing the steel scrap from the deconstruction of the Bay Bridge, not only does it create a unique facility of historical significance but it also offsets the use of the material that would otherwise be used to produce that steel. 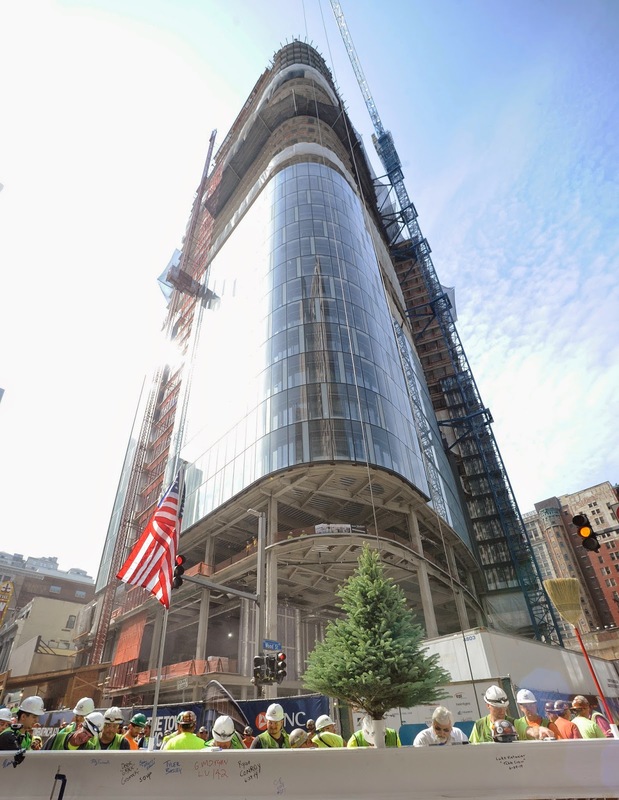 The repurposing of the bridge steel scrap, which itself contains a minimum of 25% recycled steel, benefits the group in their LEED plans. In addition to the notoriety of designing such a highly publicized facility, the students were awarded with a trophy created from an original 1933 Carnegie Steel S-curve from the bridge. They will also be offered an internship on the project and be listed as the architect on register if they do the necessary work, or the co-architect if they work with an area firm. More information available here and on official website.